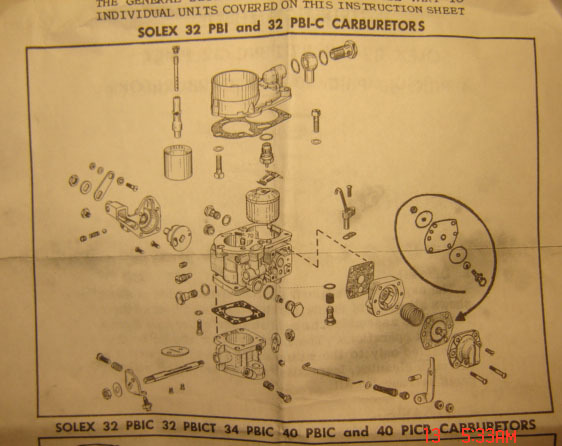 The Solex model 34 PICB carburetor is correct and original to the Mercedes-Benz model M 121.923 (1,897 cc, 4 cylinder, gasoline) engine. The M 121.923 engine is original to the Mercedes-Benz Type 180a and 180b Ponton sedans. However, this is the engine in my 1957 Mercedes-Benz Type 190 sedan. The engine was transplanted sometime before it was imported to the USA from Germany in 1980. 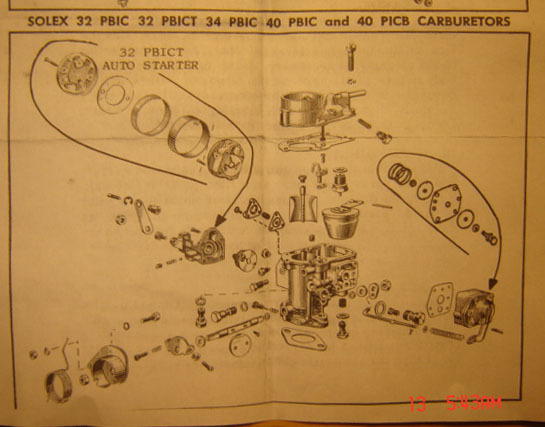 Normally, the Type 190 sedan has an M 121.920 engine and a Solex 32 PAITA carburetor. The engine cranked longer than normal before starting. 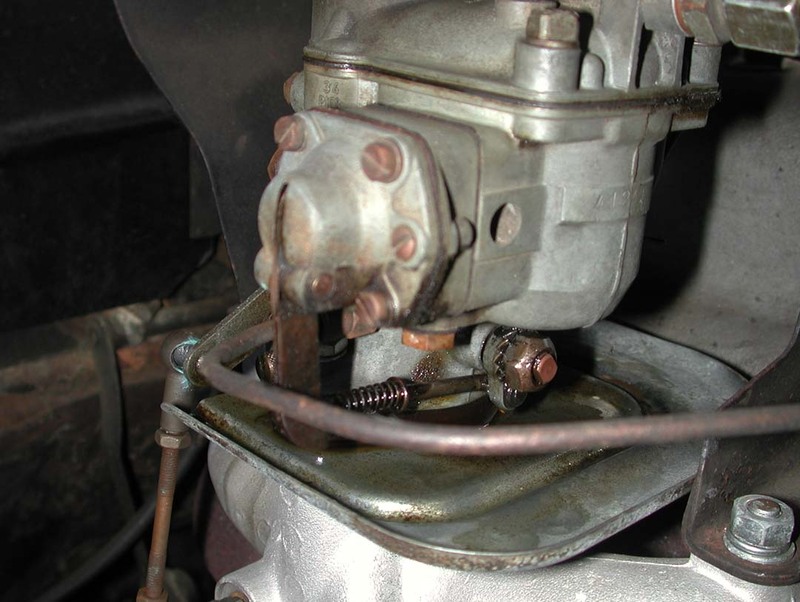 There was fuel on the drip-tray beneath the carburetor (see Photo 1). No action was taken. 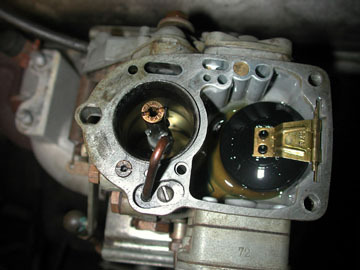 The engine became difficult to start. 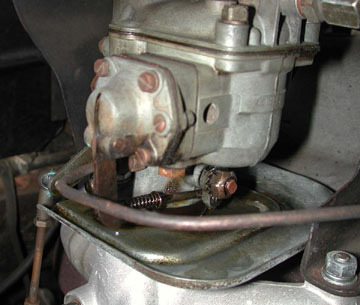 Fuel was steadily dripping from the throttle shaft (both front and rear) onto the drip-tray. While the engine was running, there were no obvious leaks. It only leaked after the engine was shut down. The engine was running rich, and it would not run for more than a few seconds before stalling. In Photo 2, the air cleaner and carburetor top were removed to reveal the carburetor bowl and float. When I first opened the carburetor, the bowl was full, but the float was submerged. Photo 2 shows the bowl a few days later, with lower fuel (due to leaks and evaporation). The float was indeed meant to sit on top of, and slightly above the surface of the fuel — not sink below. 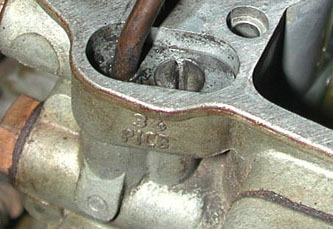 Note the Solex carburetor model, "34 PICB" embossed on the side (just below where the injection pipe comes out of the body) of the carburetor. With a submerged float, there was no way to shut off the fuel supply and the carburetor became flooded. Under normal operation, the float rises with the level of fuel in the bowl until the float lever touches the float needle valve (item 156 in the illustration, below). When the float needle valve is closed, the fuel source is shut off. The old float with a "5.7 g" stamped on the arm. The float weighs 5.7 grams. The Mercedes-Benz Classic Center (Irvine, California) supplied a new 5.7 gram float for about $24 plus freight. 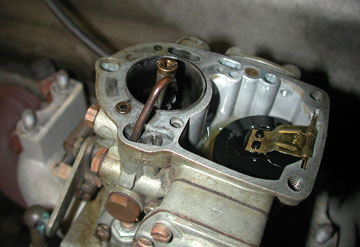 The gasket was also replaced. The new float (not shown in Photo 3) resolved the flooding problem. Figure 2. 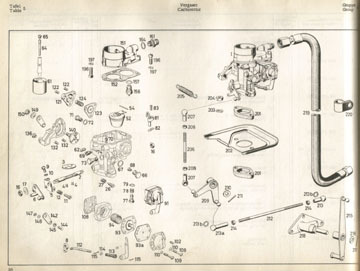 Diagram of similar carburetors (FOR REFERENCE ONLY). 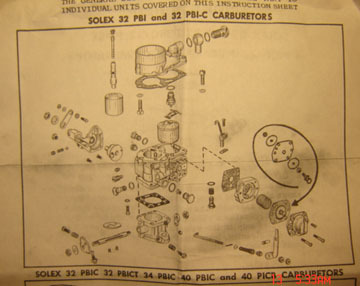 The 34 PICB is not specifically shown in this diagram. Figure 3. 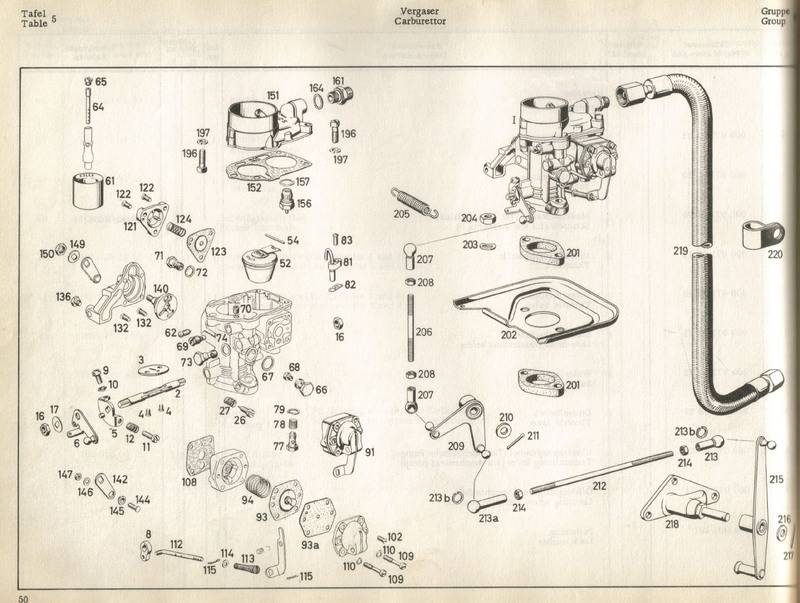 Diagram of similar carburetors (FOR REFERENCE ONLY).